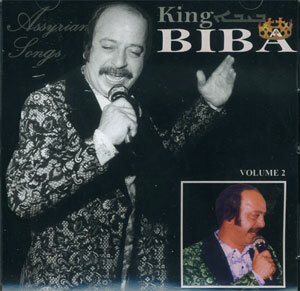 The legendary singer Edward Yousif also known as King Biba (1945 - 1995) will be honored at the 6th Annual Mesopotamian Night concert on June 15, 2013 by presenting four of his songs for our audience. Two singers will perform Biba's most popular re-arranged songs along side the 50-piece "Mesopotamia Symphony Orchestra"
Known and recognized as "King of singers’ by Assyrians in Iraq, Biba’s life is one riddled with talent, fame, love pain and tragedy…all of these factors have manifested themselves in his music, lyrics and unique and enduring voice, giving his performances a powerful impact on the listener. For many Assyrians, Biba’s songs were a mirror of their lives, reflecting in beautiful melodies their experiences of love, joy, suffering and nationalism. Biba, Edward Yousif, began singing in Assyrian and Iraqi gatherings at the age of 11. He was born in Baghdad, Iraq, in 1945, and initially only sung in Arabic, imitating his hero, the world famous Farid Al-Atrash. Influenced by the beloved traditional voice of Oshana Youel Mirza, Biba began to sing in Assyrian in 1961. He enhanced and invented a new style of Assyrian Music, a blend of keyboard instruments, Guitars and drums. According to Biba, he and musician George Ishu sought to bring to life something never heard before, a new type of music – a new sound. "We did not want to imitate Western music," States Biba, "We wanted to continue in the path of Eastern music, but possess a new sound, provide a new dimension".Biba became an instant sensation in 1961, when he began singing in Assyrian. Assyrians, Arabs, Kurds, and Turkmans in Iraq loved and admired his songs and purchased his record and tapes. His 1962 song, Near My Sight, became a hit due to the beauty of its lyrics, the uniqueness of its melody, and the fact that it was a reflection on a life experience; the song was written about Biba’s first love. Within a period of six months in 1962, Biba sold over 5,600 records in Iraq. 12,000 were subsequently produced and sold in Iran. In 1965, the president of Iraq awarded Biba a gold watch in honor of his winning singing contest on television. From 1962 to 1979, Biba appeared on Iraqi television continually. His performances in wedding, concerts and gatherings of all types have given Assyrians fond and lasting memorable Memories which are contained in this recording to last for many years to come. Late Biba resided in Chicago with his wife and daughter Krystal.